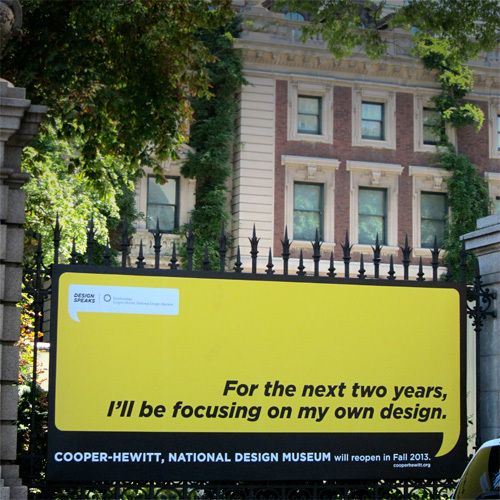 A billboard announces the Cooper-Hewitt museum is under renovation. Design studio Diller Scofidio+Renfro (DS+R) has certainly had a very good week. As we noted yesterday, the firm’s designs for the Columbia University Medical and Graduate Education Building in Washington Heights have just been released, and now today, the Cooper-Hewitt National Design Museum has announced that DS+R will be working with museum staff on the redesign of the museum’s exhibition spaces that are currently under renovation on Manhattan’s Upper East Side. The Cooper-Hewitt closed last July for an extensive, two-year face lift and is currently undergoing an extensive reprogramming that will increase the amount of exhibition space by 60 percent and rearrange the institution’s functional divisions. Gluckman Mayner Architects, with executive architects Beyer Blinder Belle are responsible for the restoration and renovation of the institution’s historic Andrew Carnegie Mansion and two adjoining row houses on 90th Street and Fifth Avenue. While the buildings are reprogrammed and historic features preserved, DS+R will be responsible for designing the new exhibitions contained in those spaces. Along with media designer Local Projects, DS+R is responsible for the visitor’s experience in both the permanent exhibition rooms on the first floor and the temporary exhibition spaces on the second and third floors. At this point in the process, neither the collaboration between Local Projects, DS+R, and the Cooper-Hewitt, nor the scope of the final product, has been decided. Stay tuned to AN for updates on the new exhibition spaces as they emerge.